These images originally came from the European Central Bank's own site here. The only modification made to them was converting the original . GIF files to . PNG. Used without express permission, but no apparent restrictions applicable here were found at the ECB's site. 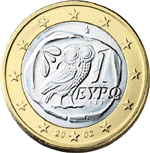 However, any potential copyright on the designs depicted on the notes and coins probably belongs to the ECB. The image above depicts a unit of currency issued by the European Central Bank (ECB). This design is copyrighted by the ECB, and its use is permitted by ECB, "as long as reproductions in advertising or illustrations cannot be mistaken for genuine banknotes".